There are a lot of applications that a ductless system can be used for In the Miami Valley. Mini split systems can be used for alleviating a hot or cold spot, help heat and cool a renovation or new construction, and even provide comfort for light commercial use. With many types of installation options available there aren’t many situations that a ductless system can’t help with. Similar to standard air-source heats pumps, mini split systems have two main components, an outdoor condensing unit and an indoor air-handling unit. The link between the two units is called the conduit, it houses the power cable, refrigerant tubing, suction tubing, and a condensate drain. 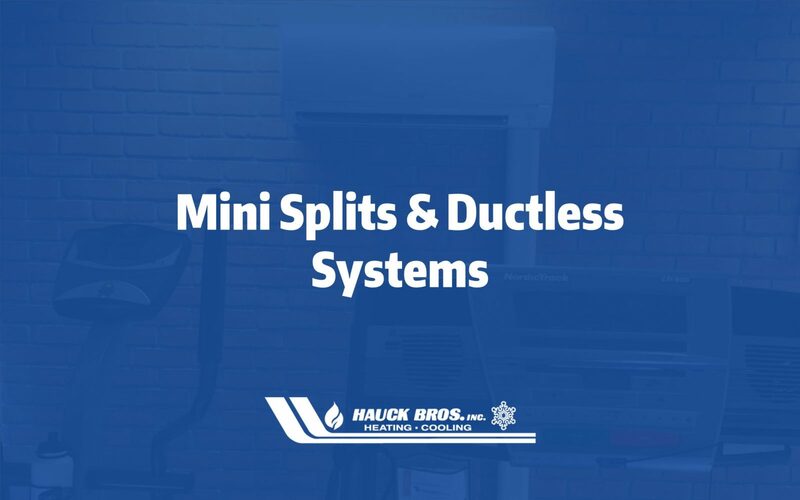 Ductless systems are available where no ductwork is needed while ducted mini split systems can use little ductwork in the ceiling or below the floor. The unit or units will operate to reach the temperature set on either thermostat or remote control. Some models can be controlled via a smart device as well. Single Zoned Cooling Only, designed to provide a high comfort level to a single room for cooling purposes only while being energy efficient (up to 24.6 SEER) and very quiet (low as 48 dB). Wall Mounted, designed to provide cooling and heating to an individual room while monitoring room conditions and self-adjusting the fan for ideal personal comfort. Units can be very energy efficient (up to 33.1 SEER & 13.5 HSPF) and quiet (as low as 19 dB), cooling only, and available in 3 speed or 5 speed fan speeds. Horizontal Ducted, designed to use ductwork which can be concealed in the ceiling or below the floor. Ideal for new construction or renovations. Units can be energy efficient (up to 19.6 SEER & 12.1 HSPF), quiet (as low as 23 dB) with 3 fan speeds. Floor Mounted, designed to fit in rooms with little vertical wall height where a wall unit or ceiling unit will not fit to provide a room with cooling and heating. Units can be energy efficient with up to 28.2 SEER and up to 13.6 HSPF, while being quiet with dB rating as low as 21, with 5 fan speeds. Ducted Air Handler, designed to accommodate new construction, renovations, replacements, and light commercial to provide heating and cooling through ductwork. Can be installed vertically or horizontally. Can be broken down to fit through tight access points and reassembled. Units can be energy efficient with SEER ratings up to 21.4 and HSPF up to 10.4 while be quiet with dB levels as low as 27 with 3 fan speeds. Mini split systems are designed to offer cooling and heating to rooms or areas to provide comfort to occupants. Designed to be energy efficient, easy to install, quiet, and easily adjustable to provide year-round comfort to make your living space comfort what you want it to be. Indoor Air Quality (IAQ), mini splits are designed to treat the air in the area in which it installed. Filters are installed on all indoor units and some models can capture and remove allergens, odors, and other contaminants to make your air clean and keep you healthy. Quiet, without ductwork or with little ductwork mini split systems are designed to deliver cooling and heating directly to the rooms they are intended to serve which means there is no need for fans, keeping the noise down, outdoor units as low as 48 dB and indoor units as low as 19 dB. SEER (Seasonal Energy Efficiency Rating) is a ratio of the amount of cooling produced (BTU) divided by the amount of electricity (watts) used. The difference between SEER and EER is that SEER accounts for changes in outside temperature instead of just one temperature. EER should be used as a comparison when the outside temperature is consistently over 95 degrees F.
The higher the SEER the greater the heat pump’s efficiency could be. Generally, most single stage heat pumps rate from 14 to 16 SEER. Two Stage units rate from 17 to 19. Variable speed units rate from 18 to 21. Comparing against a 10 SEER heat pump over 15 years*, a 14 SEER could save $1395, a 16 SEER could save $1,830, and a 21 SEER could save $2,550. HSPF (High Seasonal Performance Factor) represents the total heating output of a heat pump (including supplementary electric heat) during the normal heating season (in BTU) as compared to the total electricity consumed (in watt-hours) during the same period. With normal maintenance and care mini split systems can last over 20 years. Make sure to keep the filters and coils clean. Make sure the outdoor unit is free from obstruction and the unit is free of debris. Check the drain pan to ensure it stays clear of moisture. Inspect the refrigerant lines, visually confirming the lines are insulated and not damaged. Our experienced technicians can help you maintain the life of your equipment by performing a HCPP check on your mini split system. Some checks the technician will perform are refrigerant levels, ensure the coils are clean, check the drain pan, check the entire outdoor unit, inspect the refrigerant lines, and ensure the units are set to manufactures specifications. Contact us today to schedule a consultation!